SCRATCH SUPPER: EGGPLANT TIAN | Jane Lear. Writing on Food and Travel. Admittedly, the bases are loaded. The refrigerator contains small amounts of all sorts of things. Leftover kale that had been cooked with red-pepper flakes and lots of garlic. Cooked chickpeas, ditto garlic. Tomato sauce. Parsley. A hunk of sheep’s-milk cheese. A crumbly wedge of Parmigiano-Reggiano, picked up on the fly while dodging the San Gennaro crowds in Little Italy. Oh. And the glossy, glamorous, ravishingly purple eggplants that seduced me at the Greenmarket. I don’t know what came over me. It’s not that I dislike eggplant, but it’s not a vegetable I ever crave. But there these beauties were, at their absolute peak of sweet meatiness. I had to have them. Then I wrapped them up, optimistically tucked them into the least-cold part of the refrigerator (they hate the chill), and promptly forgot about them. Until now. Maybe it was time for the provençal vegetable casserole called a tian, which is infinitely adaptable. It can be simple (one or two vegetables) or complicated (adding a cheesy custard or cooked rice)—whatever suits your mood, your time frame, and your ingredients. And although I have never once had an original thought when it comes to eggplant, it doesn’t really matter. If I use a little common sense—and try to channel Richard Olney and Mirielle Johnston—how can the end result not be good? Besides, a great tian isn’t something you go out and shop for, it’s something that just happens when you make the most out of the resources at hand. First things first. I preheat the oven to 375ºF, and haul the various bit and pieces out of the fridge so that they start coming around to room temp. After cutting the eggplants crosswise into nice slices—not too thin, not too thick—I toss them on a rimmed baking sheet with a glug of olive oil. 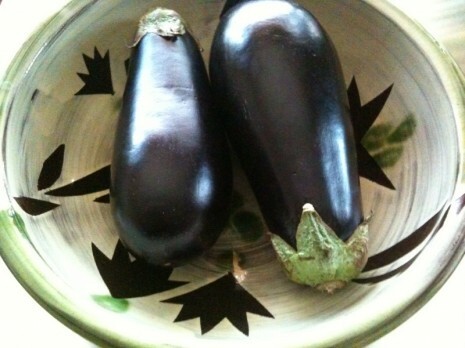 (I never bother to salt eggplant first, especially when it is in season and fresh.) Then I spread the slices out and roast them until tender. Stop: I need to make an important point here. The secret to precooking eggplant for a tian, say, or eggplant parmigiana (which is really just another casserole) is to make sure that the slices, especially the ones near the tough stem end, are completely tender. If you pierce them with a knife, the tip should encounter absolutely no resistance whatsoever. So, when roasting eggplant, patience is its own reward. Here’s a chance to pour a glass of wine, open the mail, turn off the blasted cell phone, heat the tomato sauce up in a small pot, and and oil the baking dish. Or just get horizontal. When layering a tian, I like to start with a thin layer of sauce (about a third of the total amount), so the vegetables on the bottom have something to absorb. This evening, half of the eggplant follows, then kale, with chickpeas and the grated cheeses scattered over the top. Another layer of eggplant, shingled very artistically, I think, and then the rest of the sauce. Extra Parm on top, which will end up a beautiful golden brown. Because all the elements of the tian are already cooked, it only takes 20 minutes or so in the oven, until it bubbles around the edges and, more importantly, smells done. It turns out I need the time, since I forgot about the dratted parsley. I chop it rough, along with a stray clove of garlic (which I take pains to mince, for some reason) and sauté both together in a little—all right, a lot—of butter for smearing on pieces of torn baguette. Posted: October 14th, 2010 under cooking, early autumn, scratch supper, Union Square Greenmarket. I just wanted to stop by to tell you how much joy your blog brings to my day. I follow Ruth Reichl on twitter and she tweeted about your blog several days ago, which is how I found it. Now I have a running tab on one of my three constantly opened windows devoted to your blog! I really enjoy reading food writing while I eat breakfast, and sometimes lunch, but I usually end up flying around from post to post, never quite satisfied with what I’m reading. I always want whatever it is I read to match up to whatever it is I’m eating (an unfair demand). Since I love little more than I love eating, every article inevitably falls short. By the end of my meal, my stomach is always satisfied, but my brain is often merely left to digest article crumbs. Today’s lunch was a smoked salmon sandwich with capers and soft boiled egg. It paired beautifully with your tian post, and now I have a recipe to try out. Thank you so much for your beautiful posts; I look forward to them always! I haven’t had lunch yet, and your description of yours today has my mouth watering. It sounds absolutely delicious, and if I weren’t already faint with hunger, I would run right out and buy some smoked salmon. Thanks for the great idea; I can’t wait to try it. “Or just get horizontal.” My favorite cooking instruction ever, Jane! What a delicious recipe and what a delightful blog! Ronni, what I would give for a bowl of your pinto beans right now! Am loving zenchilada.com; each issue gets richer and more of a great read….